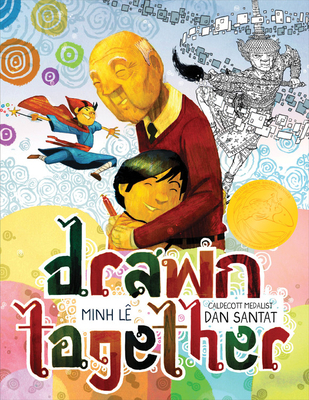 Drawn Together, written by Minh Lê and imaginatively illustrated by Dan Santat, lives up to its clever and dimensional title. It is a thoughtful story about collapsing linguistic and generational divides through love and shared passion, in this case, of art. Drawn Together is a significant contribution to children’s literature that tells both a specific tale about immigration and assimilation and a more general one about establishing inventive ways to connect. Much of the story unfolds in comic book form. It opens in silence and, mirroring the relationship between the Thai grandfather and grandson whose bond anchors the text, relies heavily on images. At the text’s opening, a young rosy-cheeked honey-skinned boy rings a door bell. The next image shows an elderly Asian man with white-hair and a big smile opening the door. The facing page is comprised of three panels. In the top tier man and boy bow to one another. In the middle tier the child and elderly man stand in the doorway waving as the boy’s mother drives away. The bottom tier shows the old man smiling enthusiastically as the far less excited boy side-eyes him. No words are exchanged, so Santat’s illustrations need to do a lot of work and they do. He captures expressions and gestures creating an overall mood of strained tolerance that wishes it was something else. In the following two-page spread grandfather and grandson eat dinner together, although they neither eat the same thing nor eat in the same way. The older man eats a dish of noodles and eggs with chopsticks. The young boy a salad, fries, and hotdog with a fork. At one point the boy tries communicating, saying in English: “So… what’s new, Grandpa?” The older man responds in a language his grandson doesn’t understand. They quickly return to uncomfortable silence. The quiet continues as they watch television, the boy does not enjoy his grandfather’s choice of film. He wanders away from the couch and to his backpack where he pulls out paper and makers. His grandfather, illustrated with a question mark hovering over his head, stands behind his grandson. The boy begins to draw himself as a caped wizard. His grandfather’s face glows as he gets an idea. He leaves and quickly returns with a sketch book, pen, and ink. The text reads: “Right when I gave up on talking, my grandfather surprised me by revealing a world beyond words.” They cannot speak to each other, but they can draw together, and they do, conversing in their unique artistic styles. They sketch alter egos and strike down fantasy demons, grandfather in pen and ink, grandson in vibrant swirling primary colors; they build a world and share it. But, the relationship forged is fragile, the distance between them can return. This is depicted as a fight with a snake-monster that the boy-wizard fights with his grandfather’s pen-sword. Once the snake-monster is destroyed, grandfather and grandson are shown running towards one another on a bridge. In this image the boy’s outfit is the black outline of his grandfather’s pen and the grandfather’s clothes are colored in the bright primaries of his grandson’s markers. Santat thoughtfully captures their struggle to connect and their will to do it by means specific to their relationship. After they are “drawn together” they embrace in real life. When the boy’s mother arrives to pick him up everyone is all smiles. Grandfather and grandson have switched art instruments and hold them up as the car pulls away. This is a sweet story that beautifully and accessibly identifies the challenges multiple generations of immigrants in the same family face – lack of a common culture and language. Santat’s work plays with the idea of cultural hybridity through a reciprocity and sharing of experiences and styles in the art of grandfather and grandson. Drawn Together represents an important American experience and will make a great contribution to personal or school libraries.